Indian cuisine is certainly known for their wide-ranging vegetarian options, but strangely enough, vegan options are often nil. Sure, some places can make dishes vegan by request, but that's where Streets of India takes that notion to a whole new level. Not only do they offer tons of vegan options, but they have something that most places don't: faux meats! 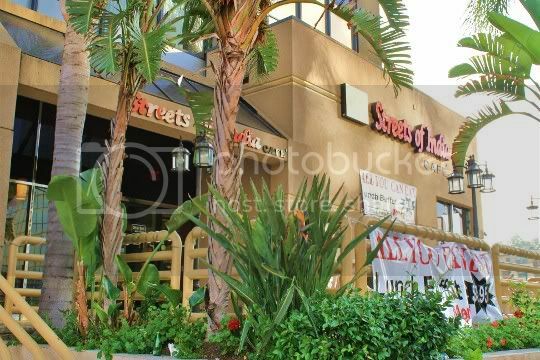 Located on the popular Ventura Strip in Encino, Streets of India clearly caters to the lunch crowd, offering a stellar all-you-can-eat buffet for only $8. I'd say this is the best time to go, as the other menu options don't give you a ton of food (and if you're gonna spend $8, get more than just one entree's worth!). The restaurant's interior, which contains the cafeteria-style buffet, is a little dark; if the weather permits, I'd suggest eating outdoors on the roomy patio. The staff is super friendly, and they're ready to answer any question you may have about the menu (which includes clearly marked vegan items). They have all the faux meats you could possibly want for a delicious Indian meal: chicken, lamb, shrimp, even fish (although this might be questionable, keep reading). The pictures below really don't do the food justice. Then again, I guess a lot of restaurant-style Indian curries aren't the prettiest dishes to look at...but boy do they taste good. 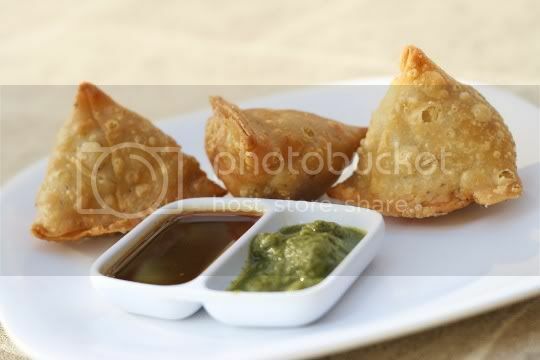 Although the menu states only two samosas come per order, the kitchen must have been feeling generous because I got three. That, or I came at the end of the lunch buffet and got the leftovers (I'm betting the latter). They definitely weren't freshly made, as they were lukewarm at best and didn't have that freshly fried crispiness. Nonetheless, they were good. Small and cute with your typical samosa flavor, they contained potatoes, peas, carrots, and lots of salt, cumin, and cardamom. The sauce duo of sweet-tangy tamarind and herbal mint-cilantro was good, although I think the mint sauce could have been a little more flavorful. Complaints aside, I'd definitely order these again. In fact, I'd probably gorge on these alone at the buffet! You will need to ask for this dish to be made vegan, as the typical tikka masala sauce contains cream. Instead, they'll substitute coconut milk. The sauce is pretty authentic, although it was the lightest and least rich version I've ever tried. Which isn't a bad thing at all. The coconut milk gives the sauce a smooth velvety texture, but the coconut flavor isn't overwhelming, and you can clearly taste the tomato emphasis. The dish includes a few chunks of chewy mock chicken (which tastes very similar to the kind used in Chinese restaurants); unfortunately, it's only about 30% of the bowl. But the sauce is so delicious, you'll want to sop it up with naan or pour it over rice. I'd order this again. 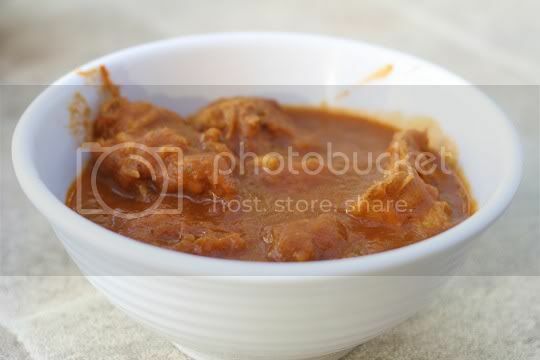 Another stringy, chewy mock meat is used in this dish, although not exactly the same as the Tikka Masala kind. This tasted more like the faux chicken drumsticks, not exactly like lamb, but still very good and meaty. And the sauce? OMG, amazing. If you like spicy food, you'll love this, and it'll have your eyes watering and nose burning through the entire dish. There's a hint of sweetness in the slighty meaty-tasting sauce, and it's so full of flavor that you may want to just eat it alone. You certainly won't want any of this to go to waste. 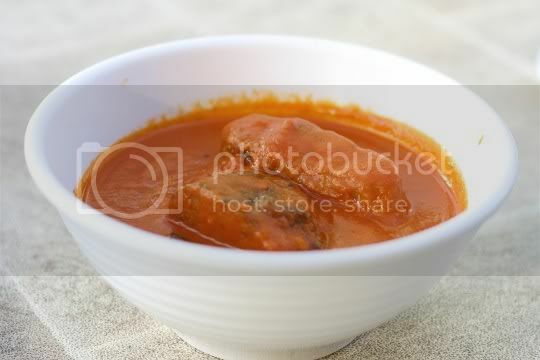 It also contains perfectly cooked potatoes, so it gives the whole dish a stew-like quality. Perfect for cold weather or knocking out the flu! Definitely a winner. I've dabbled in vegan shrimp before, but never vegan fish. How interesting! A sort of cutlet-like steak wrapped in a thin layer of seaweed, for the ultimate oceany taste. The actual "fish" tasted more like seitan, but it had a chewy and delicate texture with a mild flavor that soaked up all of the sauce. Like real fish! By far, this was one of my favorite sauces. 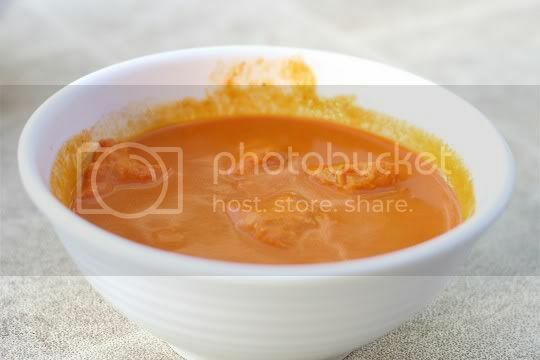 Super tangy and sour, only slightly spicy, with a tomato base and a gravy-like thick, velvety texture. Although I love standard vegetarian Indian fare, it's nice to know that there are places that offer something with some substance, for those days I want some faux meat in my life. I love that all of the sauces are light, non-greasy, and healthy tasting, but also super flavorful and aromatic. But next time, I'll definitely be hitting up the buffet!! !